David — Oh that I had the wings of a dove! For then I would fly away and be at rest by Frederic Lord Leighton, P. R. A. (1830-1896). Oil on canvas; 38 x 48 1/2 inches. Provenance: Christie's, 1868 (according to Redford); James Leathart, his sale, Christie's, 19 June, 1897 (lot 39, bought by Corns). Exhibited:	The Royal Academy, 1865, no.5; The Royal Academy, Winter Exhibition, 1897, no. 18, (lent by Mrs. Leathart -- label attached). 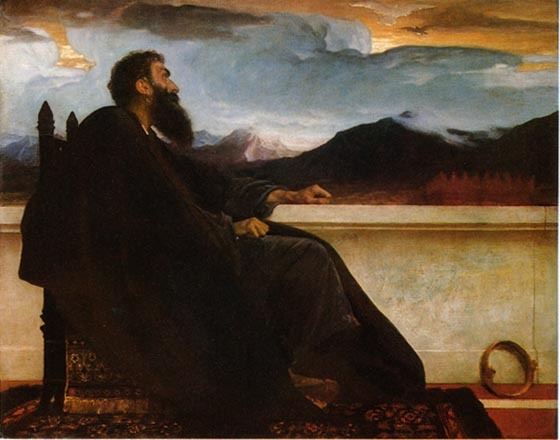 In the 1860s Leighton was particularly intrigued and attracted by the Old Testament and Jewish history. David, who was the first king of the Judaen dynasty, and as such was the ancestor and prototype of Christ, appealed to Leighton as a romantic hero. Other subjects of Leighton's which demonstrate his fascination with the Old Testament in the 1860s are Jezebel and Ahab and Jonathan's Token to David, done in circa 1863 and circa 1868 respectively. This interest may to some extent have been fostered by his having worked on a series of woodcut illustrations for Dalziel's Bible Gallery in 1863-64. Swarthy and dark-haired facial types appealed to Leighton; there exist many drawn studies of models of semitic, type. David is important in the development of Leighton's art as a relatively early example of a type of painting where the subject is isolated; in this case the figure of David dominates the picture space by being shown in stark silhouette against a plain wall and a distant horizon, and by its scale in relation to the overall size. The compositional lines of the painting converge forcefully in the head of David; his eyes reflect the vision of the Kingdom of Heaven that he has received. To some extent as a result of his work on the illustrations for Dalziel's Bible Gallery Leighton had learnt the value of simple, easily-read figure compositions in which the emotional content may be most powerful and direct. David has not been exhibited since 1697 nor described since 1904. Newall, Christopher. A Celebration of British and European Painting of the 19th and 20th Centuries. London: Peter Nahum, nd [1999?]. Pp. 32-34.